Ha! That’s impossible you may think but what if climate change, increasing temperature, will create a situation leading to desertification of Nepal. Climate change, the phenomenon of change in global or regional climate pattern, is the most debated topic of scientific community. Though some think it as a hoax most of the scientific community agree that the climate is changing. They cannot determine if it is man-made or natural. Now you are thinking how climate change will lead to desertification of Nepal. First, we need to know what we have and what our problems are. Have you felt summer in Nepal getting hotter and winter warmer? Do monsoon is as heavy as it used to be and does it arrive at the time it used to arrive? Have you heard farmers complaining and crops being destroyed by unseasonal monsoon and drought? What do you think of it? The natural resource of water for Nepal is monsoon rain, glaciers and underground water. Increasing temperature and changing climate patterns are really screwing with our livelihood in Nepal. Study done by Gautam et. al. shows the pronounced temperature increase in the upper region of Nepal which is affecting the capped snow in the mountains. Another study, done by Shrestha also shows an increase in mean average minimum and maximum temperature. The same study shows the average trend of temperature increase is 0.06 per year (Shrestha and Aryal). This is rapidly affecting the melting of glaciers and flow of river water. The projected temperature rise in Nepal is 0.5-2 by 2030 and 1.3 to 3.8 by 2060 (Shrestha and Aryal). As temperature rises, the glaciers start to melt and instead of snow our Himalayan region will get rain water. Due to this change, the precipitation pattern decreases the ability of formation of glaciers. 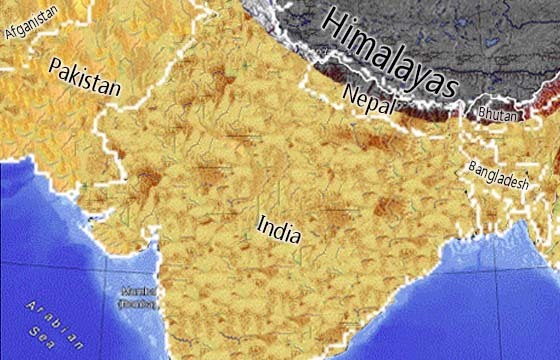 Since our sources of water are monsoon rain, which brings water from the Arabian Sea and Bay of Bengal to Nepal, and stored water in the form of glaciers and snow in the mountains will not remain there with the increase in temperature. We are already seeing irregularities in monsoon rain and precipitation decreasing year by year our soil will not get enough water. Also with increasing temperature glaciers are melting rapidly. Our largest glacier Khumbu glacier is gradually sinking. Another study, done by Rai and Bartlett et. al. showed that the glacier has lost its significant portion and its simulation shows it will lose 60% of its ice by 2040. Same trend has been observed in the other glaciers. If this trend continues then we will not have any glaciers. After the formation of Himalayas, Tibetan Plateau went dry and with no glaciers, to feed our river system, and no monsoon rains, to wet or lands, our country will go dry. Imagine how you or your immediate generation will survive if this becomes reality. So we need to rectify what harm has been done. We still can prevent Nepal from being dry by planting trees and conserving the forest. Also proper planning while developing cities help conserve natural water. We can conduct thorough research on this topic and present it to the world. Even if the world doesn't listen we can manage our regional environment by following sustainable development and natural resource planning. Gautam, Mahesh R., Govinda R. Timilsina and Kumud Acharya. "Climate Change in the Himalayas Current State of Knowledge." Xasia Repository (2013): 1-42. Electronic. Rai, Sandeep Chamling and Joe Thomas K. "An Overview of Glaciers, Glacier Glacier Retrat, and Subsequent Impacts in Nepal, India and China." 2005. Document. Shrestha, Arun B. and Raju Aryal. "Climate change in Nepal and its impact on Himalayan glaciers." Regional Environmental Change 11 (2011): 65-77.